Yesterday we viewed the Annular Solar Eclipse. No fog! Last time we had an annular solar eclipse that we could view from our own backyard was in 1992. There was no fog and if I recall it was more the middle of the day. This time it was in the evening. Not a cloud in the sky, too. As it began, the wind actually died down as if holding its breath. The seagulls came in soundlessly circling. More came in and joined the circling. This only happens when there is a storm coming in and the skies darken. And they don't circle as if they are dancing and they aren't usually so quiet. As the moon covered the sun's face they were all gone and the sparrows stopped their chattering. It looked as though someone put a round fan on the sun's face. Only the a rim of light, but still so eerily radiant. Today it is foggy. It's as though the sun is saying--so there! Or maybe it's the fog saying--so there! I am having fun with porcelain and a few glazes. I found this chun glaze works the best on porcelain. The outside is GA 23 satin glaze. 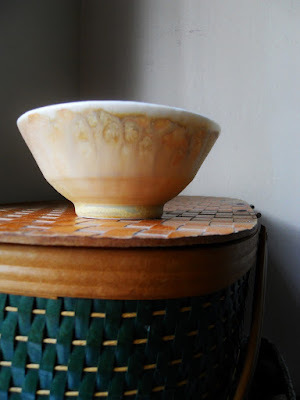 The rim is a chun glaze with .5 copper carbonate as well as the inside. 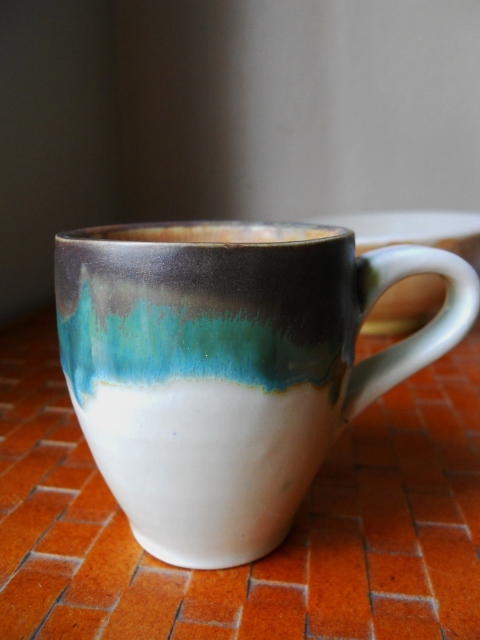 The outside of this espresso size porcelain cup is chun, inside GA 23 Rusty Bronze. I brushed on some Western Sea Moss (a commercial glaze) just on the outside rim area about 1/2". The GA 23 glaze is not something I put inside functional ware. Only outside. So far my best results using GA 23 have been on porcelain or B-Mix cone 5. All done electric fire to cone 6. Your description of the eclipse made me think of what folks centuries ago - before we knew what eclipses were - must have thought - surely that the world was about to end. Everything is so eerie and unnatural during an eclipse. Your glazes are gorgeous! Luscious - drinking coffee out of that butter-scotchie bronze would be delicious! I love how you describe the color. When I was little I loved butterscotch pudding! It is luscious and butter-scotchie! I agree with two comments before me... Very interesting. "Love is a burning thing---it makes a fiery ring---bound by my wild desire---I fell into the ring of fire" - gorgeous words ! Thank you for coming by and leaving a comment. It is always good to hear from you. Yes, you are right that those are gorgeous words! Johnny Cash was a musical poet and how he could sing. Your description of the eclipse is wonderful..I hope i'll get the chance to experience it one of these days. 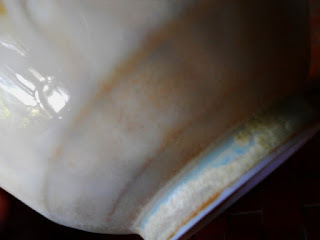 The ceramic pieces are lovely, I especially like the outside of the bowl glazed with GA 23 satin. It would be great to read the recipes too, thanks. Hello Mark---I was told there are people who actually travel around the world chasing eclipses. I guess that is not as dangerous as storm-chasing. I would, however, love to see aurora borealis someday. I will post those recipes. The GA 23 is a Val Cushing satin matte. It is a lovely glaze, but tricky. All the more interesting!